Yes, 2017 is the 10th anniversary of the iPhone. Get over it. Oh, you’re going to hear it over and over. 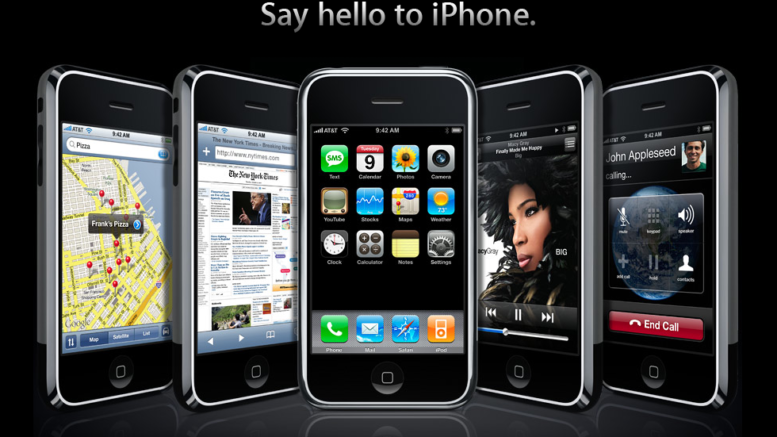 This is the tenth anniversary of the iPhone, considered the first modern smartphone. You’ll hear about how phones used to have physical buttons, how you couldn’t get on the internet before the iPhone, how the iPhone changed everything. And let me say up front that I’m an Apple guy. I like a lot about Apple, which is why I’m supercritical when they don’t live up to expectations (as I feel they didn’t in 2016.) I’m also old enough to remember what 2007 was really like and I’m not likely to believe the revisionist hype that’s come along in the meantime. I’m writing this article a little in advance of the actual release date (which the internet says was January 7) so you can have it on hand when everyone starts to gush. The first iPhone wasn’t a very good phone. People forget that the first iPhone was just not that great at making calls. At that time, AT&T’s voice network was seriously lacking in major cities, and the phone itself didn’t have as strong of an antenna as larger competitors. This continued to be a problem for Apple for years, until it was able to work with other carriers, until AT&T built a better network (which they did) and until they finally figured out how to put the antenna where people wouldn’t short it out. That all took about four years. The first iPhone wasn’t a very good smartphone, either. At a time when competitors like Blackberry could use 3G internet (which wasn’t even that fast) the iPhone couldn’t. It could barely keep up with loading web pages, even mobile ones. It wasn’t until about 18 months later when the iPhone 3G came out that it was as fast as the competition. Also, believe it or not back in 2007 Blackberry had cloud-based contacts and calendar management. iPhones didn’t. If you wanted to back up your important information, you needed a PC and you needed to actually do something. The first iPhone wasn’t good at email, either. While Apple did streamine the process for the popular home email providers like Yahoo and Gmail, it couldn’t handle work-based Exchange email at all. Setting up email accounts on an iPhone is still no walk in the park because you have to type server names and passwords perfectly on a tiny keyboard. And with the passwords, you need to type them blind. That’s fun, right? Any color you want, as long as it’s black. Throughout most of the 2000s, people swapped the external cases of their phones and made them special. iPhones not only had sealed cases, you couldn’t even change the background screen for the first couple of years. That meant your phone looked just like everyone else’s. Without a place to buy or load ringtones, it sounded just like everyone else’s, too. Back in 2007, the three big smartphone operating systems — Windows Mobile, Blackberry, and Palm — all let you load apps onto your phone. You had to do it through a cable connected to your computer but that’s not the point. There was a lot of expandability back then. I knew a guy back in 2006 who was controlling Linux servers over SSH using his Blackberry. The iPhone couldn’t do that. Hey, even Nokia dumbphones had that snake game, and iPhones, had… nothing. Sure, the largest app store in the history of humanity showed up a while later but back in 2007 it was Apple’s way or the highway, and Apple’s way had no apps. Look, I’ll agree with the upcoming wave of hype. In terms of usability (for the things it actually did), the iPhone was head and shoulders ahead of the Blackberry, which was its biggest rival at the time. Instead of tiny physical keys which made dialing difficult, the big screen gave you big virtual buttons. You could look at pictures, watch YouTube videos (which was still a fairly new thing) and it had a decent selection of built-in capabilities that worked well. No question, when you look at pretty much every phone out there today, there’s no mistaking the lineage; no matter who makes your phone now it’s probably a big slab with a glass front. That was all Apple’s idea. Just don’t forget, the original iPhone wasn’t all that special back then. By today’s standards, of course, it’s pitiful; slow internet, no storage, no apps… but even then, even by 2007 standards, it was a lot of hype without a lot of perfomance. Looking at the iPhone 7… maybe things haven’t changed as much as you’d think.